MEXICO CITY -- Five states in Mexico now have the sternest "do not travel" advisories under a revamped U.S. State Department system unveiled Wednesday, putting them on the same level as war-torn countries like Syria, Afghanistan, Yemen and Somalia. The five states are Tamaulipas on the U.S. border and Sinaloa, Colima, Michoacan and Guerrero on the Pacific coast. All the states are hotspots of drug cartel activity, either hosting trafficking routes or extensive drug-crop cultivation. The State Department had previously discouraged travel to all or part of those states but the new warnings are sterner, placing them on a level 4 warning, the highest level of potential danger. Mexico as a whole has a level 2 rating, meaning Americans should "exercise increased caution" because of concerns about crime. "Violent crime, such as homicide, kidnapping, carjacking, and robbery, is widespread," a travel advisory dated January 10 says. But an additional 11 Mexican states got a level 3 warning Wednesday, which urges people to "reconsider travel" there. Mexico has 31 states, half of which are now under level 3 or 4 warnings. Those states where Americans are urged to reconsider travel include the State of Mexico -- Mexico's most populous state, which includes most suburbs of Mexico City -- and Jalisco, home to the city of Guadalajara, the Puerto Vallarta resorts and the lakeside expat community of Chapala and Ajijic. But the travel advisory said there are "no restrictions on U.S. government employees for stays in ... Guadalajara, Puerto Vallarta, Chapala, and Ajijic." Most of northern Mexico, including the border states of Chihuahua, Coahuila, Nuevo Leon and Sonora as well as Durango, Zacatecas and San Luis Potosi, are under level 3 warnings. Mexico's federal tourism department was not immediately available to comment on the new warnings. But the government's Mexico Tourism Board said in a statement that "Mexico's major international tourism destinations have been explicitly listed as having no travel restrictions," apparently a reference to major resorts like Cancun, Puerto Vallarta and Huatulco. However, at least two Mexican resorts -- Ixtapa-Zihuatanejo and Acapulco -- are in a do-not-travel state, Guerrero, and last year, the State Department extended a total ban on personal travel by U.S. government personnel there. U.S. personnel had previously been allowed to fly to Ixtapa, the last place in Guerrero where they had been allowed to go. Personal travel by land and to the resort city of Acapulco had already been prohibited. The no-travel states had mostly already lost much foreign tourism. Tamaulipas has long been riven by turf wars between rival drug cartels, and Sinaloa is home to the cartel of the same name. 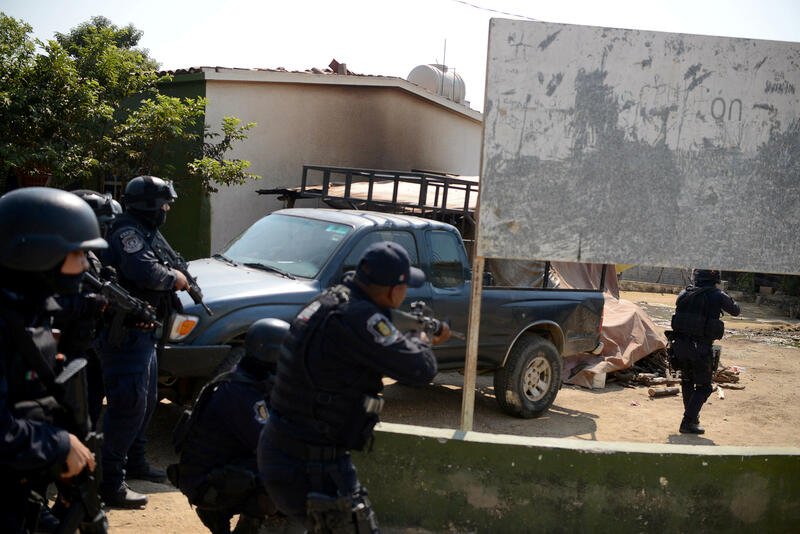 Michoacan was so dominated by a drug cartel that vigilantes took up arms in 2013 to drive them out. Preliminary figures suggest Mexico saw a record number of murders last year, the BBC reports. The year that previously had the most homicides was 2011, when over 27,000 people were killed, according to official figures. Colima has seen homicides skyrocket in recent years due to the growth of the Jalisco New Generation drug cartel, and the state now has Mexico's highest homicide rate, with 83.3 killings per 100,000 residents, according to figures for the first 11 months of 2017. The U.S. government did note its employees are allowed to go to the seaside city of Manzanillo, Colima. The state with second-highest homicide rate -- 61.6 per 100,000 -- was Baja California Sur, home to the twin resorts of Los Cabos. The state conserved its level 2 advisory, "exercise increased caution," despite a series of shootouts and killings in recent months. Rising levels of violence have not so far affected Los Cabos, which saw a 16 percent increase in tourism arrivals and an 18 percent rise in hotel occupancy in 2017, said Rodrigo Esponda, managing director of the Los Cabos Tourism Board. Esponda said local officials and tourism operators are investing in increased security, including camera systems and the construction of a new marine base. "We are going to keep working very hard in 2018 to make sure that Los Cabos continues as a safe destination," Esponda said. Speaking to local media earlier this week, Tourism Secretary Enrique De la Madrid said, "In my opinion, the most important challenge we have in the tourism sector are crime events occurring where they didn't before, for example in Cancun, la Paz and Los Cabos."